The Mercedes CLA might be the most expensive looking car you can buy for the least amount of coin. What do you need to know before you buy a Mercedes CLA? Don’t worry, we’ll tell you everything right here in the Ultimate Buyer’s Guide. The CLA is an economy car dressed in a fancy suit. But underneath the dapper garb lies a compromised Benz. But that should be no surprise, as the CLA is Mercedes’s cheapest car, and cost-cutting is almost always accompanied by sacrifices in quality. Where the CLA makes its biggest compromises is in the areas of standard content and ride quality. But despite those compromises, the Merc’s handsome looks, nice interior, solid powertrain and nimble handling makes it a worthy option in the compact luxury sedan segment. “You get what you pay for,” the voices say as you get ready to test drive Benz’s stingiest sedan. You hop into the driver’s seat expecting Fischer-Price quality plastics and Jetblue-quality seating. But what greets you is a nice cabin with a comfortable seat and soft-touch, high-quality materials. The infotainment screen, which looks like a tablet glued to the center of the dash, is a bit chintzy, but otherwise the cabin is a nice place to spend time. Despite that, there is a glaring lack of standard features present. It’s a freezing Michigan winter day, so you reach for the heated seat switches, but they’re not there. The sloping rear roof, which makes visibility a downright headache, necessitates a blind spot monitor. That costs extra. The visibility out back is equally as poor, but you’ll have to tick a box to get a backup camera. So the CLA doesn’t come too well equipped, but, the good thing is that you can get a backup camera, heated front seats and Blind Spot Assist for about $1,500. Still, despite the lack of standard content, there’s a lot to like about the actual driving experience. The 208 horsepower engine feels quick thanks to a fast-shifting seven-speed dual-clutch transmission. Passing maneuvers are a breeze thanks to lightning-quick paddle shifters, even if they feel a little too much like Nintendo 64 L1 and R1 buttons. And sure, this might be Mercedes’s first front-wheel drive car sold in the U.S., but don’t think it can’t handle. Throw the car in a turn and watch as the front end grips and grips, tugging you around the corner with finesse. It’s a joy to drive in the twisties, even if its driven wheels mean power oversteer is not an option. On bumpy roads, though, the CLA shows its A-Class roots. The platform’s MacPherson struts up front seem to struggle to isolate the cabin from uneven terrain. The ride is bumpy, and while wind noise is actually quite good, road noise is surprisingly prominent. Despite the compromises, in the end, you wind up with a car that looks like an executive sedan. And frankly, that three-pointed star out front and those swooping lines are what’s going to draw in the most buyers. [The CLA is meant to] help Mercedes catch up in the small car department and appeal to younger buyers. Audi has a range of smaller cars and BMW has the 1-Series and Mini, so Mercedes will hope the new CLA — and a related SUV — will help them catch up. So when the entry-level four-door luxury sedan for the 2014 model year, it came with a sub-$30,000 price tag, ready to go toe to toe with its German rivals. For 2015, the CLA received a larger seven-inch touchscreen for the infotainment system. That’s up from the old 5.8-inch display. Mercedes also added a new steering wheel and switched around some package content. In 2016, Mercedes changed the name of their drive modes from Agility Select to DYNAMIC SELECT. They added a Night Package option and an Adaptive suspension option. In addition, the AMG CLA45 received a 20 horsepower and 18 lb-ft bump, resulting in 375 horsepower and 350 lb-ft. The AMG also received revised gear ratios and an available Dynamic Plus Package, which includes a limited slip front differential, AMG Adaptive Suspension and “Race mode.” This results in a new 0-60 time of 4.1 seconds versus last year’s 4.8 ticks. There’s no longer a need to develop different size engines to give customers variety. One single engine can be retuned and re-accessorized, and the next thing you know, it’s making almost 170 more horsepower from the same base engine. That’s the case with this 2.0-liter in the CLA and GLA. 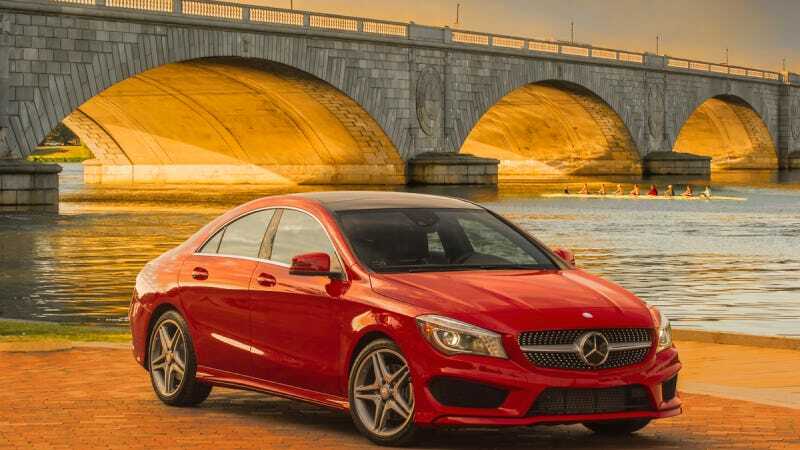 The base CLA250 makes 208 horsepower and 258 lb-ft of torque, while the AMG CLA45 makes a whopping 375 ponies and 350 lb-ft of torque with the same engine displacement! Both are mated to a seven-speed dual-clutch automatic. The CLA250 will accelerate to 60 MPH in 6.9 seconds, but the AMG CLA45 steals the show, scorching to 60 MPH in only 4.1 seconds and topping out at 155 MPH. Those 2.0-liter engines are transverse-mounted, sending power to the front wheels, though the CLA250 offers all-wheel drive, and the AMG CLA45 comes standard with power to all four wheels. The Mercedes CLA only weighs a modest 3,300 pounds, and with a small turbo four cylinder and a seven-speed transmission, you’d expect it to get good fuel economy. And the little luxury sedan does just that. At 38 MPGs, the CLA is at the very top of its class in fuel economy, besting both the BMW 2 Series and Audi A3 by 3 MPG combined. All-wheel drive fuel economy of 27 MPG is is right in line with rivals from Ingolstadt and Munich. Even the AMG CLA45 does well on the fuel economy front, remaining neck-and-neck with its rivals despite making significantly more horsepower. The Mercedes CLA comes as either a CLA250 or an AMG CLA45. The former spins either the front or all four wheels, while the latter opts for all-wheel drive only to put down the 375 horsepower. Steering for all CLAs is electric and suspension is a MacPherson Strut design up front and a multilink setup in the back. Brakes on the CLA250 are 12.6 inch discs in the front and 11.6-inchers in the rear. The performance-oriented AMG CLA45 gets bigger 13.8-inch pies in the front and 13-inch rotors out back. CLA250: Starts at $32,500. Notable standard features: 2.0-liter turbo I4, seven-speed dual-clutch automatic transmission with paddle shifters and multiple drive modes (DYNAMIC SELECT), front-wheel drive, 17-inch alloy wheels, 4.5-inch cluster display, 10 airbags, rain sensing wipers, Attention Assist, Collision Prevention Assist Plus, dual-zone automatic climate control, 12-way power driver seat with memory, seven-inch color display for infotainment system, Bluetooth integration, MB-Tex fake leather seats. Notable options: Sport Package: unique body styling, 18-inch AMG wheels, perforated front brakes with painted calipers ($2,200+$100 sport tuned suspension+$850 selective damping); Sport Package Plus: 18" AMG wheels, brushed aluminum pedals, unique chrome grille, perforated brakes with red calipers, performances suspension, performance steering, performance exhaust, unique interior trim, Sport Plus body styling ($4000); Interior Package: Leather upholstery, MB-Tex fake leather upper dash trim, multicolor ambient lighting ($1,650+Premium Package); Multimedia Package: rearview camera, eight-inch display, navigation, SD card reader, Nav and satellite radio subscription ($2,480+Premium Package); Night Package: black exterior accents, black AMG wheels, Sport package ($2,600+$500 18" wheels); Driver Assist package: DISTRONIC PLUS adaptive cruise control, Blind Spot Assist, Lane Keeping Assist ($2,500); Premium Package: heated front seats, KEYLESS-GO proximity keyless entry, Harman Kardon sound system, Auto-dimming driver-side and inside mirrors, integrated compass, garage door opener ($2,400); Panorama roof ($1,480); Bi-Xenon headlamps and LED taillamps ($850); Heated front seats ($580); 14-way power front passenger seat with memory ($400); Harmon Kardon sound system ($850); Sport tuned suspension ($100); Selective Damping ($850); PARKTRONIC with Active Parking Assist ($970); rearview camera ($460); Blind Spot Assist ($550). CLA250 4MATIC: Starts at $34,050. Notable standard features over CLA250: all-wheel drive. Similar options as CLA250. AMG CLA45: Starts at $49,500. Notable standard features over CLA250: Much more powerful 2.0-liter turbo I4, seven-speed AMG SPEEDSHIFT dual-clutch automatic transmission with paddle shifters and multiple drive modes, all-wheel drive, bigger performance brakes, AMG Sport Suspension, AMG Sport Exhaust, unique body styling, unique AMG grille, 18-inch AMG wheels, bi-xenon headlamps and LED taillamps, rain sensing wipers, 12-way power MB-Tex front sport seats with memory. Notable options: AMG DYNAMIC PLUS Package: AMG Adaptive Suspension, AMG Limited Slip Front Differential, RACE mode, Race Start function, raised top speed ($2,800); Driver Assist Package ($2,500); Interior Package ($1,650+Premium Package); Premium Package ($2,400); Multimedia Package ($2,480+Premium Package); AMG Performance front seats ($2,250+Interior Package); AMG performance steering wheel ($600); AMG Night Package: black chrome tailpipes, black air-dam splitter, black side mirrors, black side-window trim, black roof rails, black side sill inserts, black rear diffuser ($750); Aerodynamics Package: front splitter, flics in front apron, large rear wing, ($1,950+AMG Night Package); Exterior Carbon Fiber Package: carbon fiber mirror housings, front splitter, rear apron trim and side sill inserts ($3,700); AMG Adaptive Suspension ($850); Rearview camera ($460); AMG Performance Exhaust ($650); heated front seats ($580); Blind Spot Assist ($550). If we were looking for a snazzy looking luxury sedan on the cheap, we’d nab a CLA250 and throw in heated seats, a backup camera and Blind Spot Assist. In the end, after destination, we’d be paying $34,565. It might not be the best equipped luxury sedan in the class, but it looks like an elegant executive sedan, and that, combined with its handling and interior quality, makes it a decent value.